Maxwell’s demon explores the role of information in physical processes. Employing information about microscopic degrees of freedom, this “intelligent observer” is capable of compensating entropy production (or extracting work), apparently challenging the second law of thermodynamics. In a modern standpoint, it is regarded as a feedback control mechanism and the limits of thermodynamics are recast incorporating information-to-energy conversion. We derive a trade-off relation between information-theoretic quantities empowering the design of an efficient Maxwell’s demon in a quantum system. The demon is experimentally implemented as a spin-1/2 quantum memory that acquires information, and employs it to control the dynamics of another spin-1/2 system, through a natural interaction. Noise and imperfections in this protocol are investigated by the assessment of its effectiveness. This realization provides experimental evidence that the irreversibility on a non-equilibrium dynamics can be mitigated by assessing microscopic information and applying a feed-forward strategy at the quantum scale. Scientists created a nano-scale device that may facilitate the design of future computers, for example. In 1867, Scottish physicist James Clerk Maxwell challenged the second law of thermodynamics according to which entropy in a closed system must always increase. In his thought experiment, Maxwell took a closed gas container, divided it into two parts with an inner wall and provided the wall with a small trap door. By opening and closing the door, the creature – ‘demon’ – controlling it could separate slow cold and fast warm particles to their respective sides, thus creating a temperature difference in contravention of the laws of thermodynamics. On theoretical level, the thought experiment has been an object of consideration for nearly 150 years, but testing it experimentally has been impossible until the last few years. Making use of nanotechnology, scientists from Aalto University have now succeeded in constructing an autonomous Maxwell’s demon that makes it possible to analyse the microscopic changes in thermodynamics. The research results were recently published in Physical Review Letters. The work is part of the forthcoming PhD thesis of MSc Jonne Koski at Aalto University. ‘The system we constructed is a single-electron transistor that is formed by a small metallic island connected to two leads by tunnel junctions made of superconducting materials. The demon connected to the system is also a single-electron transistor that monitors the movement of electrons in the system. When an electron tunnels to the island, the demon traps it with a positive charge. Conversely, when an electron leaves the island, the demon repels it with a negative charge and forces it to move uphill contrary to its potential, which lowers the temperature of the system,’ explains Professor Jukka Pekola. J. V. Koski, A. Kutvonen, I. M. Khaymovich, T. Ala-Nissilä and J. P. Pekola: On-chip Maxwell’s demon as an information-powered refrigerator. See also, how Maxwell’s demon converts information to energy with the help of nanotechnology. Nature’s many complex systems–physical, biological, and cultural–are islands of low-entropy order within increasingly disordered seas of surrounding, high-entropy chaos. Energy is a principal facilitator of the rising complexity of all such systems in the expanding Universe, including galaxies, stars, planets, life, society, and machines. A large amount of empirical evidence–relating neither entropy nor information, rather energy–suggests that an underlying simplicity guides the emergence and growth of complexity among many known, highly varied systems in the 14-billion-year-old Universe, from big bang to humankind. Energy flows are as centrally important to life and society as they are to stars and galaxies. In particular, the quantity energy rate density–the rate of energy flow per unit mass–can be used to explicate in a consistent, uniform, and unifying way a huge collection of diverse complex systems observed throughout Nature. Operationally, those systems able to utilize optimal amounts of energy tend to survive and those that cannot are non-randomly eliminated. 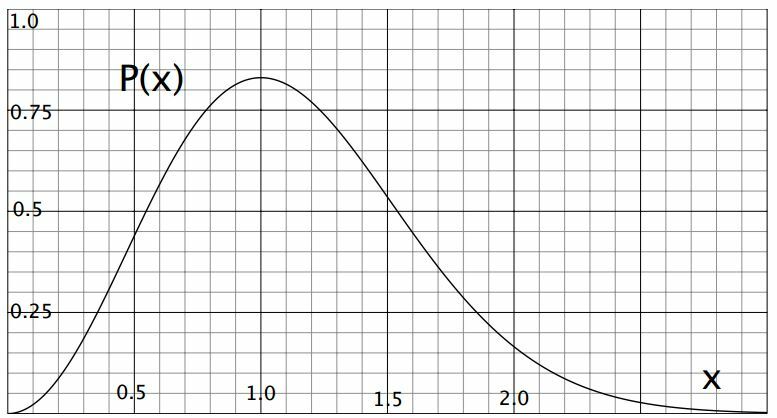 The probability distribution of speeds is given in terms of the dimensionless variable x = v/vp, where vp is the most probable speed. 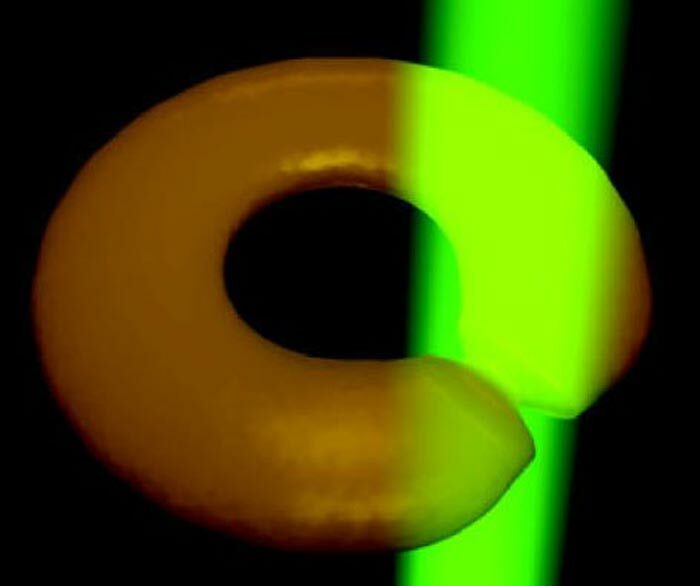 Illustration of how the BEC torus is cut by a green laser. The laser is rotated about the axis of the torus such that the cut moves through the torus. We have observed well-defined phase slips between quantized persistent current states around a toroidal atomic (23Na) Bose-Einstein condensate. These phase slips are induced by a weak link (a localized region of reduced superfluid density) rotated slowly around the ring. This is analogous to the behavior of a superconducting loop with a weak link in the presence of an external magnetic field. When the weak link is rotated more rapidly, well-defined phase slips no longer occur, and vortices enter into the bulk of the condensate. A noteworthy feature of this system is the ability to dynamically vary the current-phase relation of the weak link, a feature which is difficult to implement in superconducting or superfluid helium circuits.